Display your greenery in a sleek, sophisticated frame. LivePicture makes taking care of plants a dream. No special wall supports, plumbing or electricity required. Manufactured and designed in the Netherlands by people who understand plants and how they grow. Made of durable materials LivePicture keeps your plants looking great for years to come. Watering your living wall has never been easier. The built in reservoir allows you to go up to 6 weeks without watering your plants. Your plants stay evenly hydrated and happy. Water is added into a single opening at the top of all LivePictures - no matter how big or small! Because LivePicture fits 4" pots this means your plants and their root systems stay small and practically maintenance free. Give your plants a trim every 5-6 months to keep them looking their best that's it! Want to change up your plants? That's easy too, LivePicture cassettes pop off the frame in a snap with no mess, making replanting a breeze. LivePicture is available in 5 different sizes, and 3 colours. Custom sizes are also available. 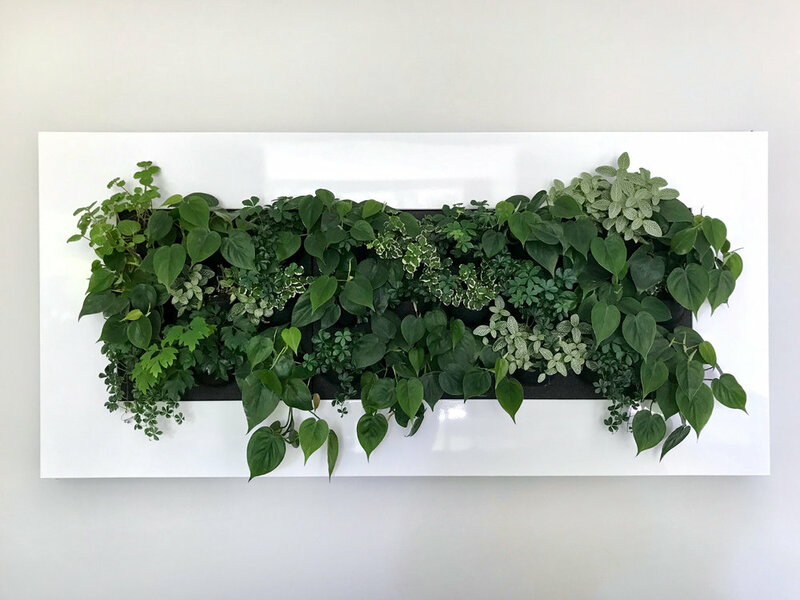 Book a consultation to see how a living wall would look in your space.